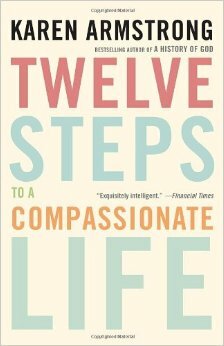 We recommend Twelve Steps to a Compassionate Life, written by Karen Armstrong, the originator of the Charter for Compassion. Read it yourself or, better yet, invite a friend over and read it together. A reading group guide, produced by the American Library Association, is available as a free download. As we at Compassionate San Antonio have been facilitating we’ve collected and written down what we did: the practical exercises we conducted, the more than 60 stories we told, scripts for meditations, even links to a few videos of class sessions! It’s been assembled into a facilitator’s manual for our own use, but we’ll provide a free copy to you as well. It’s a large PDF file — 7 MB — 124 pages. There’s enough material in it for twelve 2-hour-long class sessions, but it’s arranged so that you can pick and choose what you need for the amount of time you have. If you are facilitating a book study we would love to hear from you: info@ SAcompassionNET.org.